HiR Information Report: Sci-Fi: Kourier or Deliverator? Pardon the Snow Crash reference. Two of the main characters were "delivery folks". One, a pizza deliverator with a formidable car for such tasks. The other was a skateboard Kourier. At any rate, I both chuckled and boggled over this one. Pizza delivery. On a skateboard. 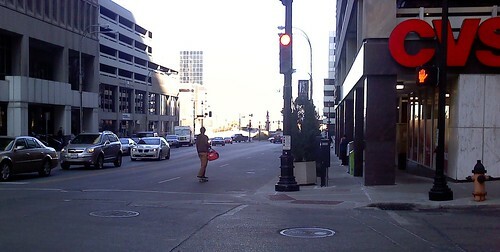 In the middle of Main Street in Kansas City, MO and right at the beginning of peak Lunch Hour. WTF?